Highland Hospital is committed to excellence in patient family-centered care. Highland Report will feature interviews with physicians and advanced practice providers to learn more about the ways they help enhance the patient experience. 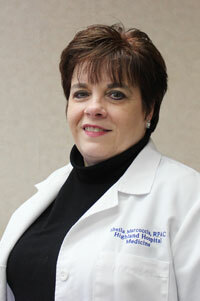 This issue features an interview with Sheila Marcoccia, RPA-C, Chief Physician Assistant. How do you help personalize the patient experience at Highland? When I meet patients I try to find something personal they are concerned about or want to talk about. Sometimes patients are worried about a family member who they help take care of or one who is particularly anxious about the patient’s hospitalization. Sometimes a patient is worried that their pet will be neglected while they are in the hospital. I try to draw out what might be causing them increased anxiety and help them work through to a solution. How do you make patient interaction work? I start the morning asking them how they are feeling and if they have any concerns or questions. I tell them what the day will be like for them and engage them in conversation until I am sure I have uncovered all their questions and answered them to the best of my knowledge. It’s important that we hear the patients, find out what’s on their minds, and establish a personal connection. How do you ensure continuity of care while the patient is in the hospital? As APPs we generally round together with attendings but we have discovered that some patients need an extra layer of attention so we may round again individually in the afternoon. Highland Hospital and the hospitalists in the Department of Medicine are so incredible and welcoming to the involvement of APPs that we can accomplish so much working together. What is the key to keeping the family informed? Often family members come later in the day. The nurse will page me and I will visit with them and explain what is going on. I make sure families have my name and let them know they can call me with questions. How do you help acclimate APPs at Highland? Most of our newly hired APPs are new grads so we try to make sure they have one-on-one time and round with several senior level APPs. That way they can see different styles, learn from several different people, and formulate their own approach to patient care. One of the issues we deal with as APPs are end-of-life experiences and it’s important for each APP to be comfortable with how they address these issues with patients and families.